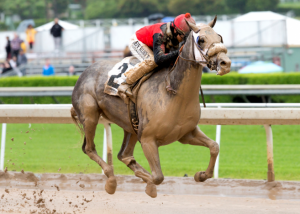 ARCADIA, Calif. (April 9, 2016)–Nick Alexander’s homebred Tough It Out came with a late rush to take command a sixteenth of a mile out en route to winning Saturday’s $200,000 Echo Eddie Stakes at Santa Anita by 4-1/2 lengths. Trained by Phil D’Amato and ridden by Joe Talamo, the 3-year-old Grazen gelding got 6-1/2 furlongs over a sloppy track in 1:17.60. Off at 5-1 in a field of nine California-bred or sired horses, Tough It Out paid $12.20, $5.80 and $3.40. Out of the Marquetry mare Mark Set Go, Tough It Out picked up $120,000 for the win, more than doubling his earnings to $212,790. The Echo Eddie represents his first stakes win and improves his overall record to 8-2-1-2. Ridden by Gary Stevens, Gold Rush Dancer made a bold move at the rail three furlongs out, opened up by about three lengths with a furlong to run, but was no match for the winner late. Off at 6-1, Gold Rush Dancer finished a length in front of Xingontothebone and paid $8.00 and $4.80. Ridden by Martin Pedroza, Xingontothebone rallied three wide through the lane and proved third-best. Off at 4-1, he paid $3.60 to show. Fractions on the race were 21.97, 45.53 and 1:11.28.